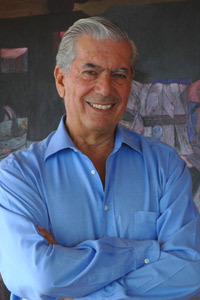 Mario Vargas Llosa was born in Arequipa, Peru. He studied two years in Leoncio Prado Military Academy in Lima after having lived in Bolivia and Peru. While studying at the Universidad Nacional Mayor de San Marcos, Vargas Llosa married Julia Urquidi. Vargas Llosa held seven jobs at the same time to earn a living. In 1959 he obtained the Javier Prado Scholarship and traveled to Spain where he obtained a PhD from the Complutense University of Madrid. He then moved to Paris where he intensified his literary work. In 1963 he published The Time of the Hero, which was met with great acclaim. He was soon hailed as one of the main figures of the Latin American literature boom alongside Julio Cortazar, Carlos Fuentes and Gabriel Garcia Marquez. In 1964 he returned to Peru and divorced Julia Urquidi. He supported the Cuban Revolution until he became disenchanted. In 1965 he married Patricia Llosa, with whom he has three children. In the following years, Vargas Llosa continued to produce impressive works including The Green House, Conversation in the Cathedral, Captain Pantoja and the Special Service, Aunt Julia and the Scripwriter, and The War of the End of the World. In 1987 he emerged as a political figure after leading the opposition to the nationalization of banks proposed by President Alan Garcia. In 1990, Vargas Llosa ran for President of Peru for the Democratic Front. After losing the Presidency in two close elections he returned to Europe. Since then he has produced celebrated works such as The Notebooks of Don Rigoberto, The Feast of the Goat, The Way to Paradise and The Bad Girl. He has also been a Visiting Professor or Resident Writer at prestigious universities such as Harvard, Oxford, Princeton, Columbia, Cambridge, and Georgetown.